A Christmas card full of praise from scorched earth eye witness Gunnar Jaklin. 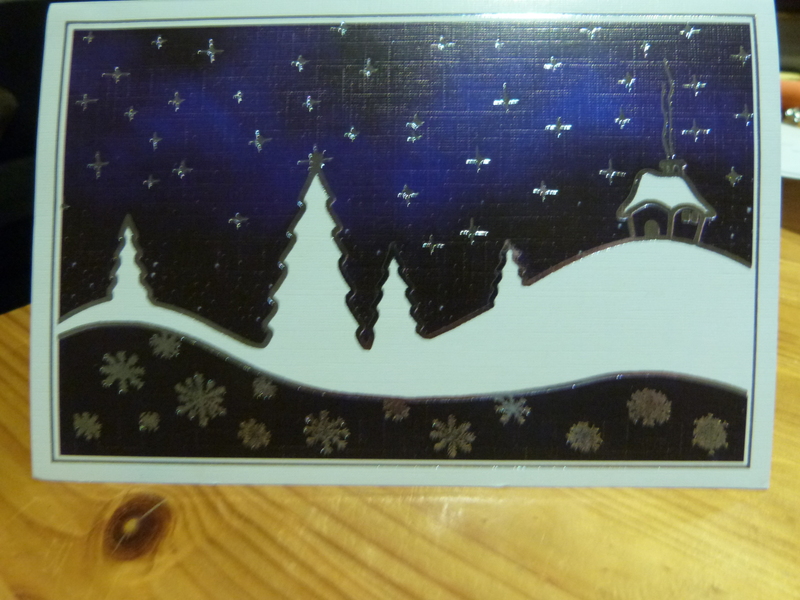 There’s another visit from my postman, this time bringing a Christmas card from another of my contributors to my scorched earth book ‘Fire and Ice’. This time it is from Gunnar Jaklin, the founder of the Tromso Defence Museum and wartime volunteer in the Norwegian army ‘police’ force in Sweden. Having fled the Gestapo when it became apparent his newspaper editor father was about to be arrested a second time, Mr Jaklin joined the 50,000 Norwegians who fled their Nazi-occupied country and sought refuge in Sweden during the war. 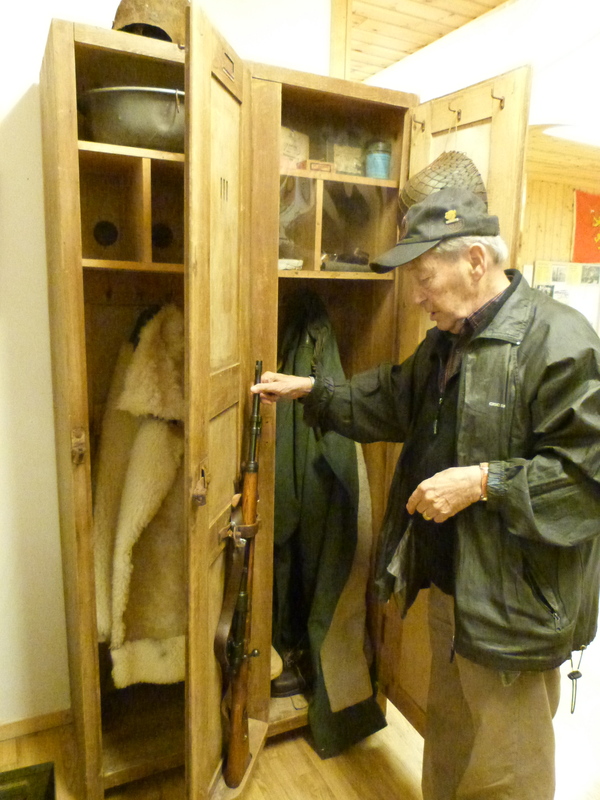 He joined the Norwegian army-in-exile there, described as ‘police’ to bypass Swedisn neutrality rules, and served in the Arctic north towards the end of the war protecting a radio station in Finnmark. At the liberation he was in Narvik and later rounded up Nazis. He is what you might call, the ‘real deal.’ Later, he edited the Tromso newspaper ‘Nordlys’ – ‘Northern Lights’. I spent two occasions with him listening to his very entertaining stories about the war, and wrote up a couple of chapters full of his anecdotes for ‘Fire and Ice’. I remember fondly our afternoon drinking coffee and eating cakes round at his house in Tromso. As a journalist and military man, he had an eye for detail and a self-discipline that would set an example to many. Gunnar Jaklin in Tromso’s Defence Museum, which he stocked, translating all the information boards into three languages: Norwegian, German and English. It’s an amazing place: well worth a visit. As any self-respecting journalist would when gathering the thoughts of a senior member of his profession, after I finished my first draft of the book I printed off my transcript and posted it to him by surface mail. Mr Jaklin doesn’t do email. He was 87 at the time – why would he? He sent it back to me, corrected and with comments, which of course, I amended. When ‘Fire and Ice’ was published earlier this year, he was among the first to receive a complimentary copy. I met so many really lovely Norwegians that it’s very difficult to come away from such intense meetings that you have during interviews not liking them, and not considering them in some way more than acquaintances – even friends. Certainly that’s true of many of the people I met. I gulped, a little stunned. Mr Jaklin was actually there. He was for me the diamond in my story – the eye witness, the creator of the museum, the gatherer of the artefacts. It would be hard to do better – and here he is sending me such a nice letter praising what I’ve done. That really is praise indeed. 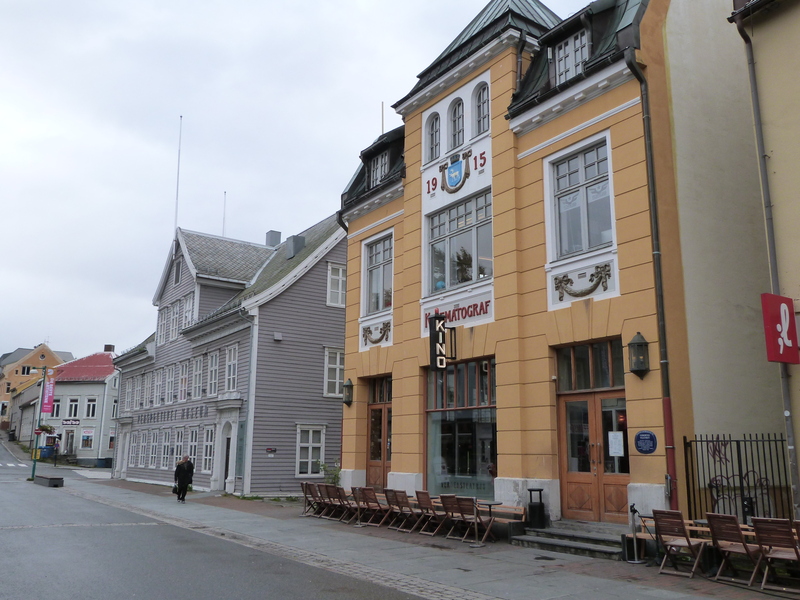 Old Tromso escaped the scorched earth burning, and so stands as an example of what the north of Norway used to be like. Pretty good, I’d say. I’ve been a little surprised at the reaction from my Norwegian contributors. Although it’s been very positive, there do seem to be certain blind spots – even for Mr Jaklin. He goes on to say that there hasn’t really been very much in Norway about the Nuremberg trial of Generals Jodl and Rendulic, who masterminded the withdrawal of 230,000 German troops, thousands of horses and a mountain of equipment, weapons and supplies from inside the USSR back along a single road to the mountains of the Lyngenfjord. The trial was in 1947 and there was outrage when Rendulic was cleared of ‘wanton destruction.’ Maybe that’s all been forgotten now? 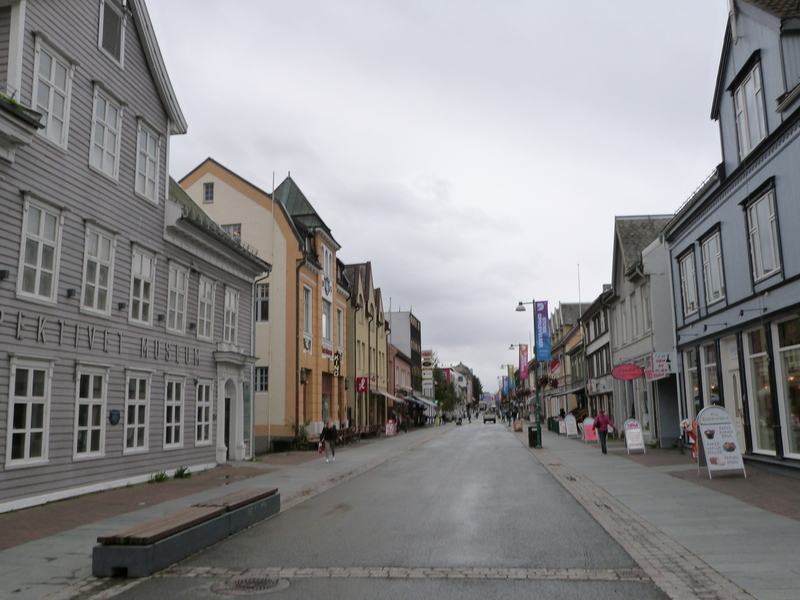 Tromso’s main street. The Defence Museum is about 15 minutes drive from here, over the skinny bridge by the Cathedral and right, opposite where the Tirpitz was sunk. I included the trial transcripts because they offered so much detail about the Nazi withdrawal and such great insight into the German position on the scorched earth destruction, especially Rendulic’s justification of it, especially Hammerfest. Hammerfest incidentally celebrates the 70th anniversary of being reduced to a smoking pile of ruins by Rendulic’s men at the start of February 2015. In the same month, ‘Fire and Ice’ will be published in America. Norwegians in America during the war did much to raise money for relief operations for Norway, so I’m hoping there’ll be decent interest Stateside in my book. I will pick out some Hammerfest and American interest extracts from ‘Fire and Ice’ over the next few posts to illustrate this, but in the meantime, may I wish all the readers of my blog and my book a very Happy New Year and great success in 2015. This entry was posted in 20th century history, Arctic Circle, Nazi, Scorched Earth, tromso and tagged history, Manchester, Norway, scorched earth norway tromso bodo, writer. Bookmark the permalink.